New parts are in the house! We have more goodies in and cannot wait to share! We’re serious, it’s like Christmas morning each day we get new stuff in, just ask our extremely annoyed shipping/receiving department about it. New product shows up and our techs swarm in like vultures! 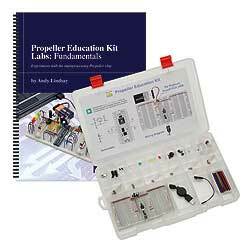 First up we have the Propeller Education Kit which is an absolute steal at $99.99. Included is everything you need to get started using Parallax’s very capable Propeller microcontroller technology. Why use a normal microcontroller when you can get 8 of them in a single chip? Included in the kit is a Propstick USB, a Propeller Fundamentals Lab/Project book, various components needed for said projects, and some neat interconnecting breadboards for rapid prototyping. We’re also proud to introduce our new Mosquit-IO Pan/Tilt kit! The Mosquit-IO is a board we had custom designed specifically to answer the call of a low cost pan/tilt controller, bringing the price down $20 from our previous Pan/Tilt Kit. 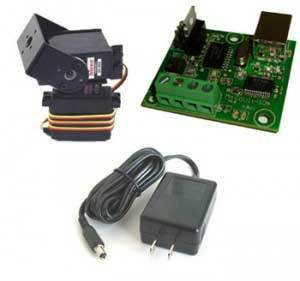 The Mosquit-IO can control two servos and a 6v DC motor, and is also available separately. A USB interface, simple command syntax, and provided .NET example code make this very easy to get up and running. Drooling over the insane torque and features of the DX-117, RX-28, RX-64 Robot servos from Robotis? We are too, and we’re making it even easier to implement them into your next project by offering a High Quality Aluminum bracket system for these. Hinge brackets, side brackets, bearing hubs, and thrust bearings! Everything you need to get started in building the ultimate high torque robot! It’s no secret that Parallax makes some awesome robot parts, but recently they’ve stepped up their game with the addition of custom CNC’d components. 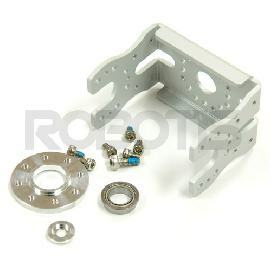 Specifically, the Motor Mount & Wheel Kit and their Caster Kit which provide the mechanical basics for an excellent robotics platform. 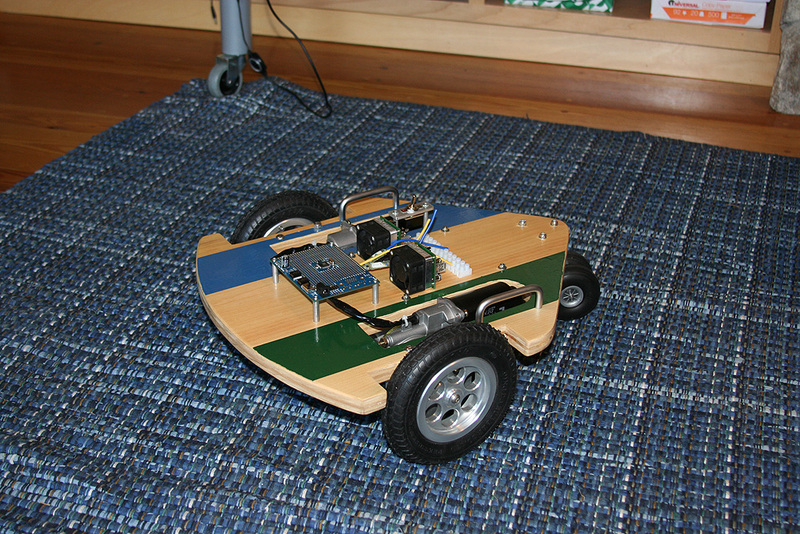 Parallax’s recent newsletter, The Parallaxian, has a cool little project overview showing just how easy it is to create a wheeled robot base using some of their spiffy new components and good old plywood. Used in this project is the Motor Mount & Wheel Kit, the Caster Kit, and a pair of HB-25 Motor Controllers. 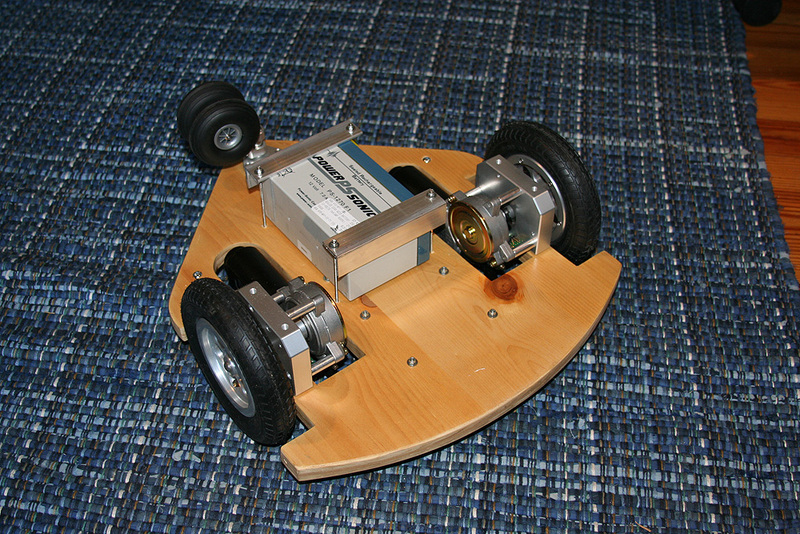 What we found neat was how simple this robot was to design. Rather than go through the trouble of designing the base in CAD and having it milled, the components were just laid out onto plywood, traced their outline, and holes for mounting them were cut and drilled using a jigsaw and drill. Ingenious! Be sure to check out the Parallaxian Newsletter for details. The Parallax Scribbler Robot is in the house! We’re proud to now offer the Scribbler Robot from Parallax, which is a fantastic choice for the beginner enthusiast. This versatile little bot is aimed at ages 8 and up, but is flexible enough for even a more advanced enthusiast to enjoy. 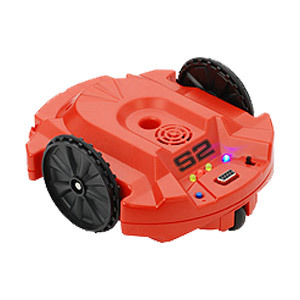 This robot offers a variety of demo programs that come preloaded as well as a Visual GUI based programming option and a true text based Basic programming interface. This means that while the robot will work out great of the box, it won’t be something you will quickly outgrow.